Over the past few months, we have been working on a product which we feel may be of benefit to the local community – an app which we simply call “Death Notices”. Death Notices is an app which contains the funeral notices for those who have passed away in your local community. You can search for notices via surname and by area, viewing which undertaker added the notice. This brings both benefits to the app user and the undertaker as it modernises an industry which had predominately been dominated by the newspaper. A companion website is also available for undertakers which allows them to add notices and new notice areas to the app. The website also allows the undertaker to keep their information up to date. Adding notices is instant and immediately available on the app. We feel that Death Notices will be of use to those living at home and further afield – allowing them to keep up with their local community. A no obligation trial is available of the companion website to undertakers and we would love to work with them in order to improve the service. For more information, please visit – https://www.protosoftware.co.uk/death-notices-for-undertakers/. 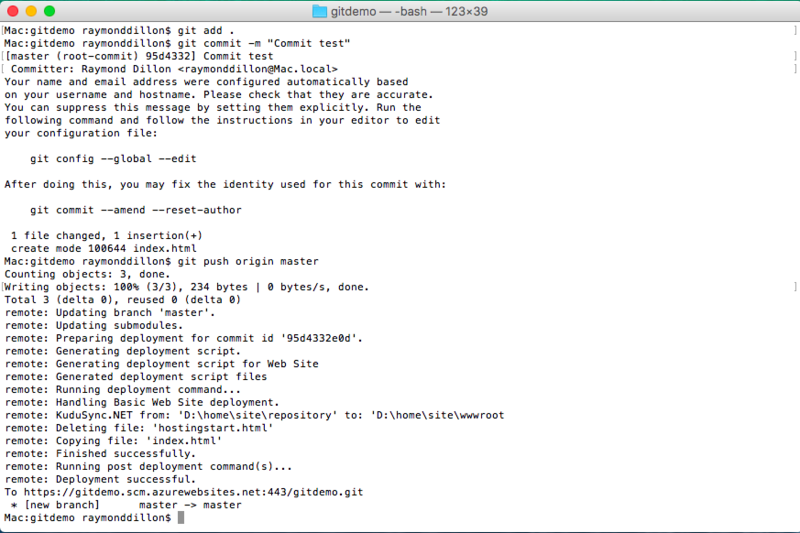 Git deployments are very useful as they allow for a developer to deploy a web app from a code commit, and it is a nice way of developing as opposed to copying files via FTP. 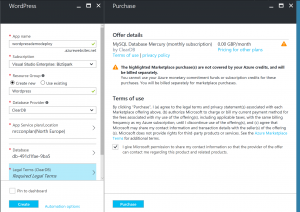 As with everything on Azure – it is very easy to do. An empty web app has been crated (New -> Web App). To enable git deployments, navigate to the properties of the newly created web app, and click on “Deployment Options”. Click on “Choose Source” . From this, you can select a number of different deployment options, such as linking the web app to a TFS repository, a BitBucket account, or even One Drive. We are going to deploy to a local git repository. To do this, select “Local git Repository” from the menu and click OK.
Once completed, under the properties section of the web app, click on “Properties”. Navigate to the “GIT URL”, and copy it. 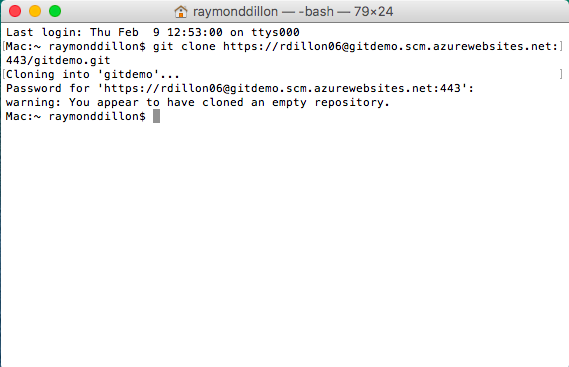 Next step is to open a git command line and run git clone with the newly created git URL. To illustrate the process, a simple index.html file is created and dropped into the new folder. This code is then added to the repository. Once this deployment has finished, if we refresh the page, our changes are already present. 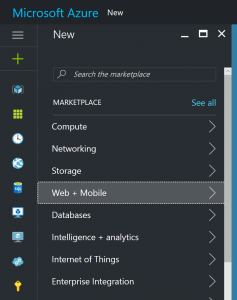 Deploying a WordPress Website to Azure could not be easier and can be achieved in a few easy steps. Once logged into Azure – Click on the plus sign along the left hand side – a menu should appear. Once this menu has appeared, click on “See all” beside Marketplace. Another menu should appear. In the search bar, type “WordPress” and click on the first item on the list. Another menu will appear giving you some information on WordPress – click the create button at the bottom of this screen. App Name – This is what you want your web address to be (it is in the format websitename.azurewebsites.net) – in this case, we have picked wordpressdemodeploy.azurewebsites.net. Resource Group – Often, a feature on Azure is made up of may different components – a resource group allows you to group these components together for easy management. 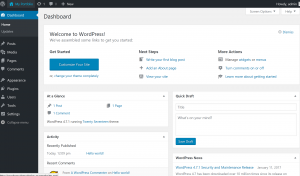 In this case, we have created a resource group “WordPress” for all things WordPress related. Database Provider – There are two options present here – ClearDB and MySQL in app preview. We will select ClearDB as it is not in preview. You get one ClearDB 20MB Database free on your subscription. App Service – There may be a default app service automatically created, but if there is not, follow the wizard to create one. Database – This is a name generated by ClearDB – no need to change it. Legal Terms – These must be accepted in order to use ClearDB. Once Happy with all the details, click on Create. Wait a few moments and you will receive a notification saying that the website has been created. Once created, navigate to the web address – in this case http://wordpressdemodeploy.azurewebsites.net. You will then be shown a language selection screen – select your language and click continue.  Site Title – This will appear at the top of your website. 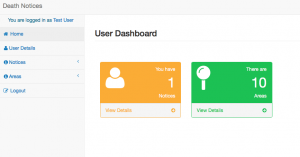 Username / Password – These will be used to log on to the website. 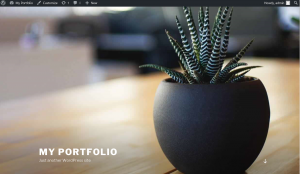 Email – This will be used by WordPress to communicate with you (with regards to updates etc). Once happy, click “Install WordPress”, and wait a few moments. 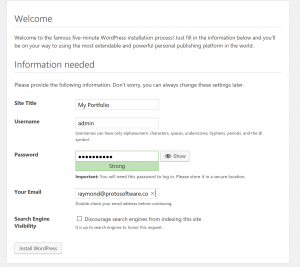 You will then be taken to the admin site for your WordPress install, where you can style the website to your needs. To access the front end for your website, remove the /wp-admin part of the URL. In days gone by, the only way to interact with your computer was by typing commands using the keyboard. This then progressed onto using a keyboard and mouse which has been the norm for many years. If we wanted information, we typed it into a search engine, or a search bar on a website, or navigated through various menus using a mouse. However, what happens when you are not quite sure what you’re looking for, or there are simply too many menus to navigate through putting you off? To put it simply, a bot is an artificial brain that can be taught all about a topic. For example, it could be taught all about your business, what products and services it offers, opening times, links to social media etc. Customers can then interact with your bot on a variety of platforms such as on a Web Chat on a website, Facebook Messenger or Kik – they can now have a conversation with your business. Bot technology is brand new and is already proving popular. To the business, it provides a unique way to provide information to the customer, in a quick and efficient manner. To the customers, it provides a way for them to interact with a business in ways that they are already familiar with such as Facebook, Skype and Kik. 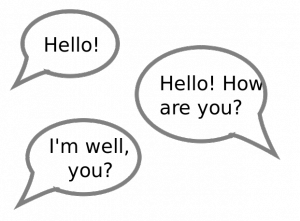 Businesses and customers can now have a conversation again. I’m curious. Tell me more! 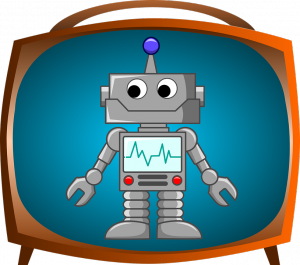 If you would like to see what a bot can do, click here to meet Proto Bot. If you are interested in a bot for your business, get in touch with us at info@protosoftware.co.uk. The internet of Things has become a talking point in recent years, but what is it and what value does it have for business? The Internet of Things (IoT) can loosely be defined as connecting your everyday “things” to the internet allowing them to “talk” to each other or communicate with websites and apps. 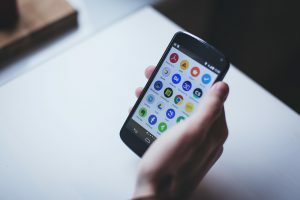 For example, you could connect a temperature sensor in your house to the Internet and view the data on an app on your phone. Traditionally, information within businesses travel along the more “familiar” routes, with information being lodged in databases, analysed in the form of a report and then passed onto management. This information path is now changing with the physical world around us becoming an information system with more common sensors and devices being connected to the internet. This can have many benefits depending on your business area- for example, IoT technology could be applied to your factory line to provide management with real-time analytics data of performance on the factory line – this can then assist in predictive maintenance of machines on the factory line, saving money and downtime, allowing maintenance on machines before they actually fail. 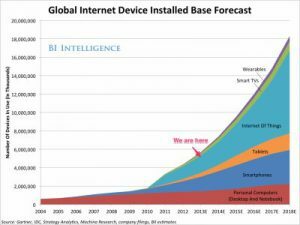 Regardless of your business area, the dynamic nature and endless possibility of IoT technology will allow it to fit your business needs. The IoT ecosystem is an emerging market and according to Gartner, there will be more than 9 billion IoT devices by 2018 – can you afford to miss out? We all have a mobile phone in our pocket with many apps installed on it – we communicate on our phones, do our shopping and managing our banking all from our pocket. A mobile app for your business can open up new avenues and new and innovative ways to reach your customers. Get location based notifications – if a customer walks close to one of your shops, you can send them a notification to entice them in. Mobile apps have proven successful in the market as compared to email campaigns – 97% of notifications sent to a mobile phone from an app are read as opposed to just 10% of email campaigns. Contact us today and see how you could use a mobile app within your business. The UWP Community Toolkit is available as a Visual Studio NuGet package for new or existing C# and VB.NET projects. The project is hosted on github and is maintained by the community. Easy to add visual effects Animations allow you to implement specific XAML behaviors and apply visual composition to your application, such as Blur and Fade. You can also use code to chain animations together without using XAML. Notifications are a key UI component to help UWP applications with user engagement. Live Tiles and Toast samples help you get started using them fast. Custom controls Additional to SDK Ready to use Controls were built to be fast and up to current UWP coding standard. They include HamburgerMenu, RadialGauge, SlideableListItem and more. Modern applications need to connect to cloud services. The toolkit show you how to connect to Bing, Facebook, and Twitter services. Code helpers are classes that simplify common coding patterns like Color conversion, Internet connection detection, StorageFile helpers, and more.